This is it: the ultimate competition. We’re looking for the one item that says “SMITHSONIAN” like nothing else — and you get to decide the winner. Our museums, research centers, and zoo have picked one iconic item each as its champion in the Smithsonian Summer Showdown. These titans of the Smithsonian will battle head-to-head through three rounds until there is ONE winner! Voting for Round One ends August 4. Vote now! My first round picks are the T. rex in the science category (natch), the issue of Wonder Woman #1 in culture, the Star-Spangled Banner in history, and the Landsdowne portrait of Washington in art. I’ll be very surprised if the flag doesn’t emerge as the last artifact standing when the final round of voting closes. You know, I think it’s the iconic “superstar” objects that really make the Smithsonian what it is as far as most people are concerned, especially when it comes to the National Museum of American History. Despite the comprehensiveness of the collections, and despite all the work that goes into researching, writing, and installing exhibitions on particular aspects of the American experience, what most people really want to see at the Smithsonian are these one-of-a-kind treasures, the kinds of things you can see at the NMAH and nowhere else: the Star-Spangled Banner, Washington’s uniform, the ruby slippers, and so on. Museums have changed a lot in the past few decades, but I think what still draws in most visitors is the opportunity to stand in the presence of extraordinary objects. And there’s nothing wrong with that. Robert Inman, who wrote the script for the new King’s Mountain play I mentioned a few days ago, has a guest post about the campaign over at Appalachian History. The play has its premiere this October, and after that it’s going to be an annual summer production. Inman has evidently done quite a bit of writing for both theater and TV. I’m hoping I get a chance to see the show. In case you haven’t heard, it’s Batman Day. I’ve been a fan since I was about eight; the Tim Burton film was probably the first major movie that I went nuts over, and I accumulated a pretty good stash of Bat-collectibles over the course of my childhood. I still think Frank Miller’s Dark Knight Returns is one of the greatest works of modern fiction. Seriously, if you’ve never read it, get yourself a copy. It’s an unlikely concept for an enduring cultural icon, when you think about it—a vigilante who dresses like a flying rodent. What accounts for a career that’s lasted more than seven decades? I think it’s a combination of factors. The character has attracted good writers and artists, and he has the best rogue’s gallery in comics. Most important of all, I think, is the fact that underneath that cowl is a man of flesh and blood instead of steel. Anyway, happy 75th, Mr. Wayne. Here’s to another three quarters of a century. The settlers came to the backcountry of North and South Carolina and quickly adapted to the frontier area. “They had to be rugged, independent people. They endured hardships, they had to fight Indians. They persevered,” Inman said. When the war began, the backcountry patriots just wanted the British to leave them alone. “The British said, ‘You have to support the crown.’ They said, ‘No, that’s not the way we operate.’ And so, they took up arms against the British and won,” Inman said. The backcountry settlers who fought in the Southern Campaign have been the subject of dramatic works before, especially in the 1950s, when Pat Alderman‘s outdoor drama The Overmountain Men premiered in Erwin, TN. It told the settlers’ story from the genesis of the settlements west of the mountains through the Battle of King’s Mountain. These frontiersmen were sons of frontiersmen, accustomed to the rugged life of the new country.…This unhampered wilderness freedom, far removed from royal rulers and their taxes, was to their liking. These bold, resolute men were self-reliant. They were independent, individualistic, and not always inclined to respect or observe the niceties of the soft life. Living on the outskirts of civilization, their law was to have and to hold. In fact, you could quote lengthy passages from books on the backwoodsmen written in the late 1800s and find many of the same sentiments. It’s fascinating to see how popular notions about the eighteenth-century frontiersmen have remained so steady. For more information about Revolutionary-era settlers on the stage, check out Gordon’s book on John Sevier in myth and memory. (Sevier was the subject of his own biographical play about sixty years ago.) And if you’d like to see an outdoor drama about the eighteenth-century settlers for yourself, Sycamore Shoals hosts a very popular and long-running show every year. Now Brooks Simpson has drawn our attention to the latest instance of a neo-Confederate trying to make sense of a document and failing spectacularly. If you haven’t seen it yet, it’s a doozy. Over at Cold Southern Steel, a diligent researcher and defender of Southron Heritage presented what he believed to be evidence that Lincoln had a slave. This supposed evidence had been hiding in plain sight in the 1860 U.S. census, but had apparently gone unnoticed for lo these 150 years. Here’s a close-up of the census list which was posted to Cold Southern Steel. As you can see, it indeed names one Abraham Lincoln of Springfield, IL, occupation “Lawyer,” along with the members of his household. Included in the list is “M. Johnson,” an eighteen-year-old female. Her occupation? So right there it is, proof that Abraham Lincoln had a “servant” in 1860. Ergo Lincoln was a slaveowner. Right? Well, no. “M. Johnson” was not a slave. She was Mary Johnson, a free white girl employed by the Lincolns. In this context, “servant” doesn’t mean an enslaved person. It’s a job description. In the nineteenth century, many middle-class families employed young women and girls as house servants, often on a live-in basis. A lot of these women were immigrants from Ireland or Germany. In Springfield, about one-fourth of the homes had hired help of this kind around the time Lincoln lived there. As a prospering family headed by a respectable lawyer, the Lincolns employed several women over the years, some of them as live-in servants. 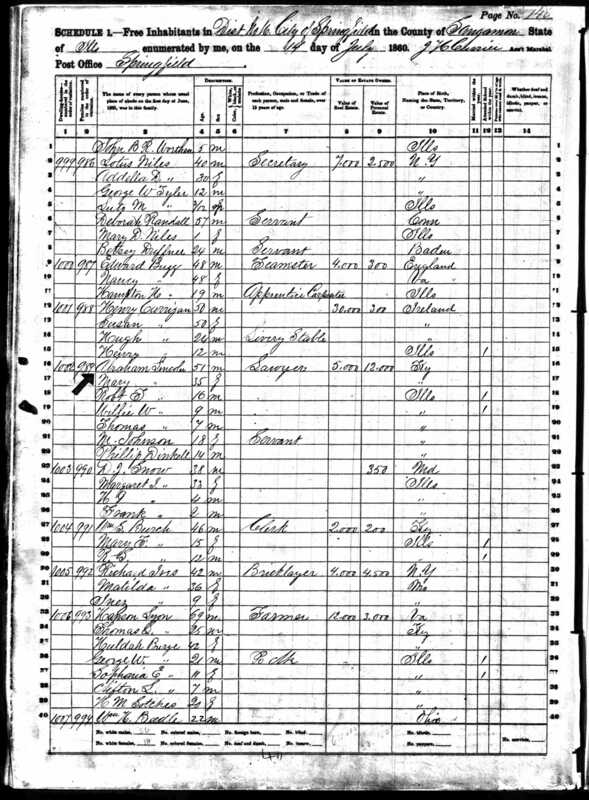 For example, eighteen-year-old Catharine Gordon was working and living with the Lincolns in 1850, and appears in the census for that year. In 1860, the same year that Mary Johnson turned up in the census, Mary Todd Lincoln employed a Portuguese teenager named Charlotte Rodruiguis as a seamstress. A woman named Margaret Ryan claimed that she witnessed some of Mary Todd Lincoln’s worst behavior during her employment in the house, although the chronology behind her claims is iffy. (Richard Lawrence Miller discusses the Ryan evidence in the third volume of Lincoln and His World.) These women and girls were not slaves bound to work for life. They were not the property of the people in whose homes they worked. Now, here’s the really funny part. The proof that Mary Johnson was a free woman is right there in the 1860 census, the very source being offered as evidence that she was a slave. In other words, the problem here is that the blogger in question simply doesn’t know how to read the document. Here’s the page in question. See the very top, where it says “SCHEDULE 1.—Free Inhabitants”? That’s sort of an indicator that all the folks in that list were, you know, free inhabitants of Springfield. The 1860 census counted slaves separately. You’re not going to find any slaves officially listed in a census list of free inhabitants. Now, check out the very bottom of the list, where all the individuals are tallied up by race and gender. Twenty-six white males, fourteen white females. All forty people on the page present and accounted for, and each one of them white. This list does not include any African-American residents of Springfield, let alone enslaved ones. Incidentally, the Lincolns did employ a free black woman named Mariah Vance as a cook and laundress a couple of days a week for ten years. Now, just because these women and girls were free doesn’t mean their lives were all beer and skittles. By many accounts, Mary Todd Lincoln was an absolute Gorgon as a boss, difficult to please and tight-fisted. She was particularly critical of Irish girls—the “wild Irish,” as she referred to them in a letter to a relative. According to the NPS, Mary Johnson was of Irish background herself, so she was probably on the receiving end of Mrs. Lincoln’s temper at one time or another. (For information on Mary Todd Lincoln’s domestic help, check out Jean Baker’s fine biography, pp. 105-08). But the women and girls who worked for the Lincolns were not chattel slaves, and were not the family’s property, despite the fact that they worked in the home and sometimes lived there. There’s a lot of neat information to unpack in that list of names. It shows us a time when middle-class Americans were very conscious of their status, when hired help was an indicator of that status, and when working in someone else’s home was the fate of many a young European-born immigrant girl. 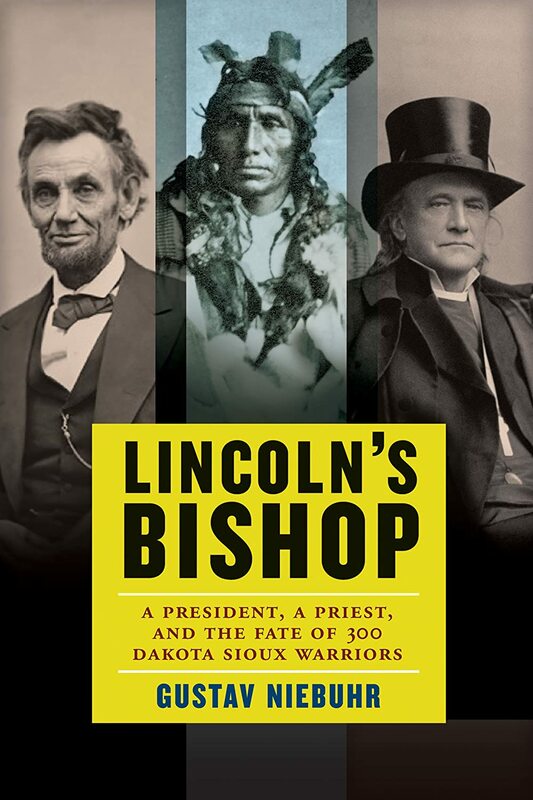 It tells us a lot about the Lincoln family’s economic and social circumstances, about how they saw themselves and wanted to be seen by others. It offers us a glimpse of a world somewhat similar to our own, but also strikingly different in terms of the way people conceived of their ranks and roles. But it doesn’t show us evidence of slavery, and it takes a spectacularly negligent misreading to make it say otherwise. Primary sources are wonderful things, but only if you know how to make sense of them.